Warm & overcast conditions meet the anglers on the Chalet Bank for this latest open match. Winner on the day was Mick Bull (Frenzee) from peg 78, Mick weighed in 188-08-00 fishing waggler. 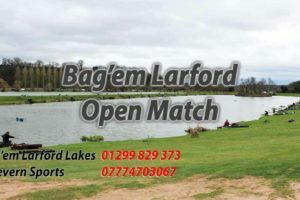 3rd was Ray Lamb (Larford) from peg 76 weighing in 142-05-00 catching on pellet waggler. 4th on the day was Ant Perkins (Cwmbran Knobblers). Ant caught on pellet waggler landing 141-10-00. 5th placed was Paul Cook (Frenzee), Paul weighed in 113-06-00 from peg 64 catching on pellet waggler.